AI apps are shaping up to be an essential part of financial institution and fintech offerings. Yet these innovative solutions are only as useful as the data they can access. In our webinar, we’ll show you how to apply predictive analytics and AI to a massive scale of data to derive valuable insights and power more personalized user experiences. From financial wellness apps that help your customers save money, to chatbots that assist users with making payments, the better you understand your users, the more relevant your solutions will be. Learn how AI technology and tools can help detect patterns in financial and transactional data, predict future events and even enable you to suggest a course of action for your users, resulting in a deeper and more meaningful connection. 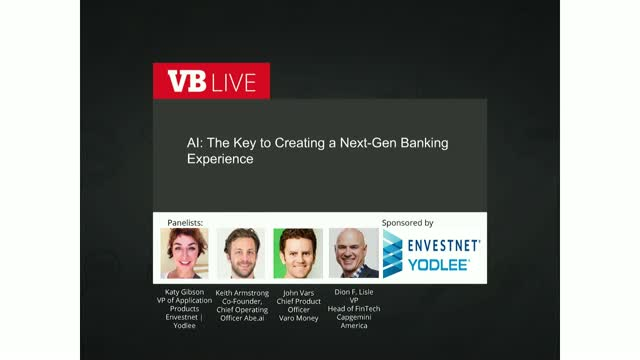 * Dion F. Lisle, VP Head of FinTech, Capgemini America Inc.